Sometimes you just need to pamper yourself a little bit. I don’t mean full-fledged 8-hour spa days, we’re talking simpler,much simpler. Say what you will, but there is something incredibly indulgent in the simple mani-pedi. I decided to treat myself today and WOW am I happy I did. Typically I just do the home manicure and pedicure, opting to save the $30 for something else. My schedule recently, however, has not left me with a great deal of time or energy to do that so I finally bit the bullet and took a coworker’s recommendation for a place near our office. I’ve had pedicures all over the country – coast to coast – but I have to admit that today’s was one of the most satisfying. Perhaps because I needed it so bad, as the nail technician kept telling me (I had to explain that I had been dancing sans shoes just a few days ago at a friend’s wedding, to which she frowned at me), or maybe it was the hot stones they used to massage my feet and legs… either way, it was just AMAZING. 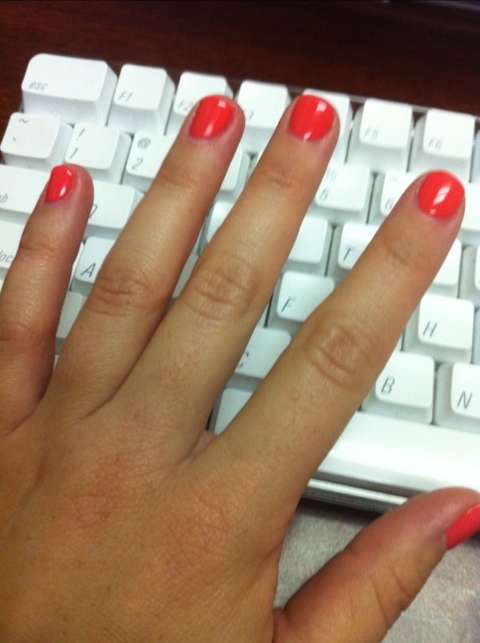 My manicure was equally nice, though slightly more rushed. I even plopped down a few extra bucks to get the shellac nail polish so that I could break the bad habit of picking at my cuticles (a stress behavior I fall into when I’m not paying attention). I used to have my nails done for this exact reason – to deter me from ruining the investment and destroying my cuticles. We’ll see if it helps this time around. I found myself staring at my newly cleaned, moisturized and painted nails, just sparkling away as I typed emails on my keyboard and couldn’t help smiling. Who knew the simple things like a mani-pedi could bring so much joy? I’m determined to continue my simple pampering with a home facial to repair the mess that the “makeup trick” of spraying hairspray over your makeup to make it stay all day, did this past weekend. Sensitive skin and hairspray are not friends. They’ve never been friends. They will never be friends. Remember that. Anyone have tips on home facial tips or any other simple pampering practices I should try? What are your favorite little ways of pampering yourself?